It’s warmer than a cap, sticks out in a crowd and declares your allegiance to the mighty Blues. Get your Stripe Pompom Beanie from our 2019 NSW Supporters collection and show the flag with flair at this year’s State of Origin. A pompom beanie is the ultimate supporters wear for State of Origin. It not only keeps your head warm at those cold games, it also shows the flag for your team in no uncertain terms. 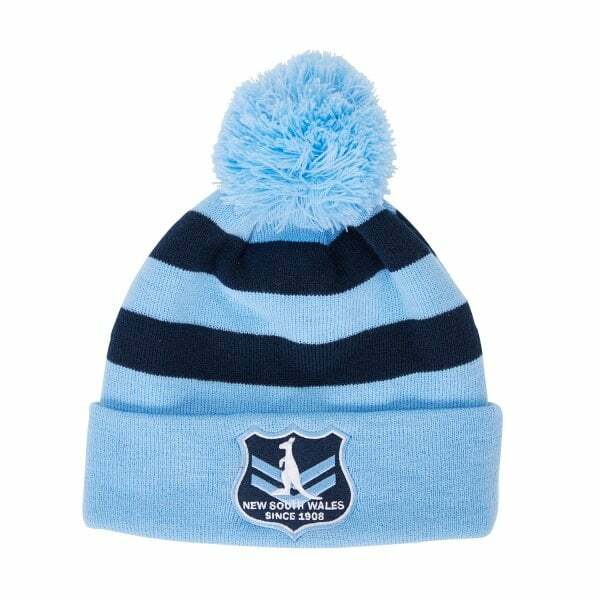 And Canterbury’s Stripe Pompom Beanie from our 2019 NSW Supporters range does both of these things with flair. It keeps your noggin warm when it’s cold and the prominent stripes and coloured pompom on the crown leave no illusions who you barrack for. The vintage style badge at the front celebrating the NSW Blues since 1908 puts the finishing touch on this classic supporters wear from Canterbury.